This Pole Mounting Hardware is Displaying (1) 30"w Flag! 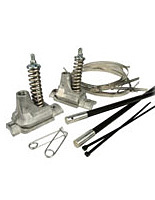 This Online Retailer has a Variety of Banner Brackets Available! This Pole Mounting Hardware is Economically Priced! Zip ties and pins secure street flag to brackets. Wind tunnel tests show brackets reduce 87% of the wind load, compared to lesser models. 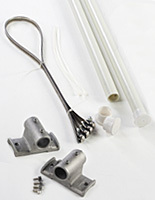 Pole mounting hardware is constructed of rust resistant cast aluminum for long term use. Screw gear bandings are 40" long to fit most standard lampposts. This pole mounting hardware is for displaying a 30"w street flag in a downtown area or on a campus. Banner brackets are great for promoting various events since the flags are positioned above ground level where they are near impossible to miss. 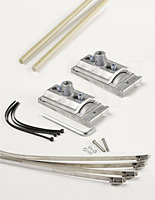 Pole mounting hardware, called a banner bracket, comes with (2) banner rods, (2) brackets, (6) bandings, (2) pins, (2) zip ties, & instructions. Buyers just need a flag and a lamppost! Pole mounting hardware is made of cast aluminum. Regardless of sun, rain, or snow these banner brackets will work great. Buy banner brackets to display a custom flag today. The bandings with this flag hanging display are 40" long so they will fit any standard post up to 12-3/4" in diameter. This pole mounting hardware is heavy duty for years of use. Unlike some of the more costly banner hanging kits sold this display does not adjust on the pole instantly. Each street flag display is pole mounting hardware that is inexpensive for that reason. These brackets can be adjusted on lamp posts, however all the bandings will have to be loosened then retightened once in the desired location. This lamp post bracket is pole mounting hardware that is for (1) 30"w flag, yet many consumers will buy (2) units for displaying multiple banners on one post. Banners can easily be switched out for the change of seasons; users will just need to purchase extra zip ties. 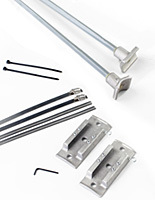 This street banner hanging kit is pole mounting hardware that is easy to install especially with the detailed instructions [see below]. These flag brackets have been wind tunnel tested. The results from the test on this pole mounting hardware is included so buyers can have peace of mind knowing the banners will still be standing after some strong winds.